E was so very proud of himself this weekend. Although the field was sloppy, his team (the alligators) played soccer – their second game of the season. I didn’t see it myself, as I was out on an adventure of my own, with my step-daughter (we were horseback riding in the pouring down rain, but what fun it was!). 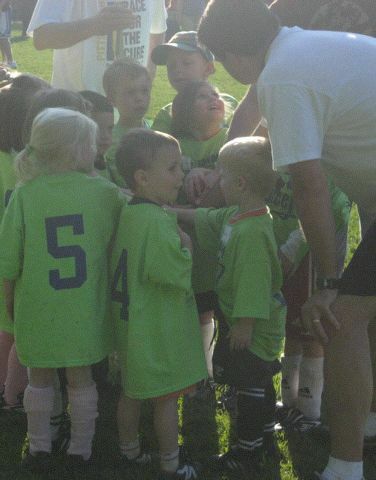 M was amazed at how demanding the coach was of this team of four/five-year olds. The coach was shouting and telling them to hustle and not to be lazy, he made them run around and get excited. 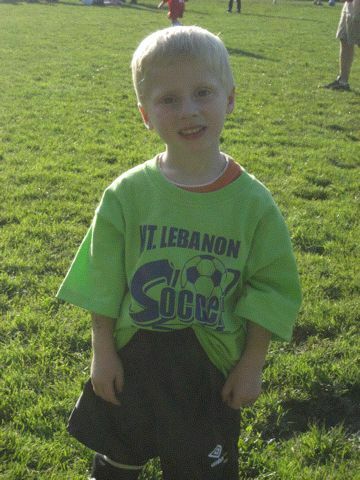 So, my E, the littlest one on the team ran his little heart out and scored his very first goal in soccer. He played last year, with no goals – mostly kicking and dribbling the ball away from the soccer field. The coach told all the other players, “Now that’s what I’m talking about!”, when E scored. Needless to say, E was ecstatic about it. He went ahead and scored another three goals after he got the hang of it. He was beaming from ear to ear when he told me. We’re so proud of him, our little athlete. Can’t they find some shirts that fit these little one 🙂 I actually don’t remember ever scoring a goal in the 6 years or so that I played soccer, then again I was usually a defender.